Mr. Broadnax (center) with former Scullers Jazz Club booker Fred Taylor and singer Donna Byrne during a party in Taylor’s honor last year. Still nimble at 92, Paul Broadnax played his last two gigs on back-to-back days in mid-July. Mr. Broadnax, who died Aug. 1 in his home in Newton’s Lasell Village of complications from a lung disease, had been a staple of New England’s jazz scene for nearly eight decades, appearing as a vocalist and pianist since his Roxbury childhood as a son of classically trained singers. As a teenager, he performed at a USO event in Roxbury for World War II-bound soldiers. 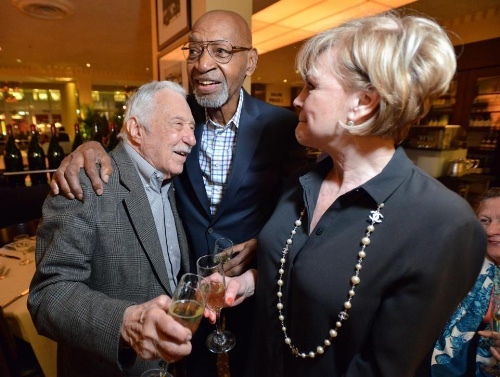 As a 91-year-old, he was at Brasserie Jo last year paying tribute to former Scullers Jazz Club booker Fred Taylor. With neither wasted nor gratuitous notes, Mr. Broadnax soloed that day as he often did, with spare, eloquent improvisations and carefully chosen chords. The two met in the military during World War II, when both were assigned to Special Services as musicians. While performing for the troops, they launched a friendship that transcended music and lasted more than 70 years. Over the decades, Mr. Broadnax either shared the stage with or arranged for a constellation of jazz greats, among them bandleader Lionel Hampton, trumpeter Clark Terry, singer Jimmy Witherspoon, and vocalist Rebecca Parris, who died earlier this year. He also was a contemporary of jazz singer Joe Williams, to whom he paid tributewith the 1996 CD “Here’s to Joe,” which featured Mr. Broadnax on the cover, toasting Williams with a flute of champagne. Trenner played with Mr. Broadnax on that album, and they were joined by Herb Pomeroy on flugelhorn, Peter Kontrimas on bass, Matt Gordy on drums, and Fred Haas on saxophones. “He had a gentle but relentless sense of swing. It was never forced, but regardless of the tempo or the feel, there was always a deep groove,” said Haas, a Dartmouth College professor who played with Mr. Broadnax on four other CDs. While playing in the background as other musicians soloed, Mr. Broadnax might slip in substitute chords that enlivened the arrangement and added “a sense of richness that the original composer didn’t get,” Haas said. Mr. Broadnax, who was born in Cambridge, shared the stage with and arranged for a constellation of jazz greats. His mother was the former Rebecca Ellastine Lee, a soprano soloist, choral director, and well-known voice teacher. She also was a dressmaker and bartered those talents to secure piano lessons for young Paul. Returning to Roxbury after World War II ended, he began playing with ensembles at jazz venues throughout the region. He also set up other sources of revenue to supplement his earnings as a musician. Mr. Broadnax attended what is now the Wentworth Institute of Technology to be certified as an airplane mechanic, and he graduated from Northeastern University with an associate’s degree in engineering. He worked at Raytheon for many years before leaving to focus more on music, and also ran an Amway business. Mr. Broadnax married Millicent Brooks and they had two sons before their marriage ended in divorce. “Even though he had the ability to make everyone under the sun feel special, it never took away from his affection and attention to us as his sons. We both felt just as valued and esteemed,” said the Rev. Jay Broadnax, pastor of a church in Philadelphia. “He was a very spiritual man as well. He loved God and felt his music was a gift that he wanted to share with the world,” his son said. In addition to his wife and son, Mr. Broadnax leaves his other son, Marc of Pottstown, Pa.; two sisters, Leona Broadnax Emerson and Rebecca Broadnax Scott, both of Hyde Park; and two grandchildren. Family and friends will celebrate the life and music of Mr. Broadnax at 11 a.m. Sept. 1 in the St. Paul AME church in Cambridge.